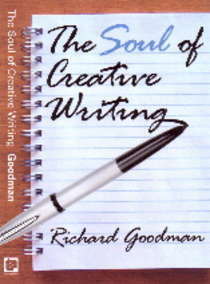 I'm re-reading Richard Goodman's book, The Soul of Creative Writing. I'm reading the book because I'm going to interview Richard next Saturday morning, as part of his appearance at the Writer's Loft, so it is something that I had to do. And now I'm glad I followed my instincts and told my partner Terry that I would happily take on this job, because all of Richard's books are excellent (you should also check out French Dirt). Earlier today, I re-read Richard's chapter on style. This is the first chapter of the book, and it is called The Music of Prose. In it, he makes the point that "the sound a writer makes on the page is music." Goodman says that we, as humans, are innately musical "for the simple, profound reason that we have a heart." All of us live with the steady rhythm of our heart beating within and thus come by music naturally. Goodman then goes onto cite different kinds of musical prose: lyrical writing, comedic writing, detective fiction, and government writing. (Don't get the wrong idea here, when he says government writing, he is talking about the likes of Thomas Jefferson.) Goodman talks about how an essential aspect of music is rhythm, and in writing, rhythm comes from sentence structure. Varying sentence structure is a key way of creating a rhythm for your writing. I've seen this over and over again with some of my student's work. I often start out reading manuscripts and writing the same thing over and over again–"Vary sentence structure!" One of my favorite students wrote a whole manuscript in the same cadence over and over again, using the same structure for every sentence: subject-verb-object. I probably wrote that phrase, "Vary sentence structure!" a hundred times when we first started working together. But she was an eager student and soon got what I meant. She revised the book and went on to sell it to a national publisher last year. Goodman references the famous point made by Eudora Welty, that when we read, we hear the words in our mind, almost as if someone is speaking them to us, and he says, "To be conscious of the music in your writing is merely an acknowledgment of how we read, of how we absorb words." Good writers "hear" their style as much as anything and this is one reason why it is a good idea to read your work out loud. This facilitates getting the rhythm of our work deeply inside us, inside our minds and hearts, because, really, this is what it is all about.